Femur fractures after motor vehicle accidents can be one of the most painful types of injuries that you might suffer after a crash or wreck of a motorcycle or after being hit as a pedestrian by an automobile. If your femur is fractured in an accident, you will likely have also suffered other serious injuries because of the amount of force that it takes to break a femur bone. There are several different types of fractures that can happen to your femur, and pedestrians and motorcyclists have greater risks of suffering from these fractures than do car occupants. If your femur is fractured, you will likely be taken directly from the scene of your accident to the hospital for treatment. A Los Angeles personal injury attorney might help you to recover compensation for your losses if your accident resulted from a motorist’s negligence. Your femur bones are the long bones that run from your hip to your knee. They have femoral heads that insert into your hip joints. The femoral neck is also called the thigh bone, and it is the strongest bone in your body. 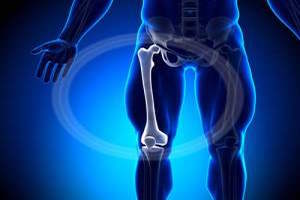 The femur also has a long shaft that runs the length of your upper leg to its distal end, which connects into your knee joint. Because of the strength of your femur, it takes a significant amount of force to break it. When there is a high-impact crash, significant physical forces are released. These forces may be strong enough to fracture your femur bone. The American Academy of Orthopaedic Surgeons reports that car crashes are the leading cause of femur bone fractures. The second leading cause of fractures to the femur bone is a fall from a height. Because substantial forces must be involved to break a femur bone, it is likely that damage will also be done to blood vessels, muscles and ligaments, which could be even more dangerous than the fracture itself. If your femur bone protrudes through your skin after an accident, you will also have a high risk of developing an infection. There are several types of fractures that can happen to your femur bone. Fractures of the femoral neck are most commonly seen in elderly people whose bones have become more fragile over time. When this portion of the femur bone is broken, it is referred to as a hip fracture. Fractures may also happen anywhere along the length or shaft of the femur. Fractures to this portion of the femur are normally caused by the violent trauma that is associated with a car accident or a fall from a height. These most commonly occur in adolescents and adults. Fractures at the distal end of the femur are often referred to as knee fractures, and they can be caused by car accidents. Fractures may involve complete or partial breaks. Some femur fractures are stress fractures to the neck, which are normally seen in elderly people. Femur fractures may also involve crushing injuries to the bone, causing it to splinter. Motorcyclists and pedestrians are particularly susceptible to suffering femur fractions in collisions. Both groups have little to protect them from the physical forces that are involved in the crashes. By contrast, car and truck occupants have some protection from the metal shells of their vehicles, which help to absorb some of the force before it reaches them. The height and angle of a car when it impacts a pedestrian or motorcyclist may also make it strike the person in the femoral area, breaking the bone and causing other injuries. Femur fractures may cause people to die because of blood loss, infections or blood clots. It is very important for people to seek immediate medical attention if they believe that they have suffered a fracture to their femurs. The particular treatment that you might receive for a femur fracture will depend on its location and its severity. If your fracture did not result in displacement, your doctor may choose a conservative treatment such as rest, crutches and a cast. Most fractures of the femoral shaft will require the implantation of metal rods and screws inside of it to reattach the broken pieces and straighten the bone. The screws are used to secure the rod to the bone on each end of the rod. If your fracture is above your knee or below your hip, your doctor may use metal plates to reattach your bones, fixing the plates in place with screws. If your bone protrudes through your skin, your doctor will also likely treat you to prevent an infection. You may be given an intravenous course of antibiotics as well as a prescription to take oral antibiotics once you are released from the hospital. After your initial treatment, you may also need to undergo physical therapy and rehabilitative therapy so that you can regain your ability to walk easily. Pain medications may also be prescribed, and as your bone heals, you may need to do an exercise regimen to regain the strength of your muscles in the affected leg. If you have suffered a femur fracture in an accident that was caused by someone else, you may need legal help. Contact an experienced Los Angeles personal injury attorney to learn more about your case and your rights.